Organic rice is rice that is free of pesticides, dyes and other chemicals, making it very safe and healthy consumption toddlers, adults and seniors. There are several kinds of organic rice namely color: black, red, brown and putih.Tak wonder that people often call it herbal rice. Aroma and taste of organic rice cooked Indonesia is very different when compared to organic rice from India, Thailand or other countries. 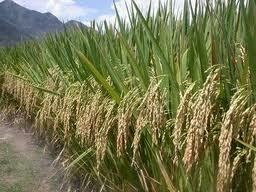 Organic rice from Indonesia has a superior taste better because the soil structure. Smells good and durable storage. Safe and very well taken by people with Diabetes, Obesity, etc. Good for your diet program, Preventing cancer, heart disease, gout, high blood pressure, and vertigo. How different from the rice planting was "normal" for example, irrigating fields should not be mixed with rice fields using fertilizers and chemical pesticides, this also applies to the milling process which also should not be mixed with rice 'normal'.